The Case of the Missing Marquess: An Enola Holmes Mystery. Philomel Sleuth, (2006). Currently available. Face Value: This is a terrific cover illustrated by Peter Ferguson. I love Enola’s hunted look, her bicycle, her period-specific clothing, and the twisting trees in the background. This cover conveys the notion that something is amiss, which is exactly what a good mystery cover should do. This is also a pleasantly sophisticated cover illustration for a middle grade novel. Does it break the slate? Absolutely. I learned about Enola through this blog post from The Nerdy Book Club. When I started the book, I was a little disappointed with Enola. She wasn’t as bold and brassy as I had hoped. BUT WAIT! Enola undergoes a major philosophical shift that helps her grow into an absolutely Slatebreaking young woman. And I believe that’s what makes Enola such a wonderful character for young readers: they get to experience her change in perspective while reading. Who would we give it to? Mystery lovers, especially kids who enjoy the original Sherlock Holmes stories. Adults who can’t get enough of Sherlock on the BBC or are eagerly anticipating Elementary on CBS will also enjoy reading about Enola. Review: There’s nothing as indulgent as historical fiction with specific, luscious details about the era in which it is set. Nancy Springer obviously did her homework before writing The Case of the Missing Marquess. The book is packed with descriptions of clothing, décor, food, and environs specific to the early 1900s. As a major history geek and lover of the early twentieth century England setting, this book was a treat. What is especially wonderful about these details is that they are actually important in the grand scheme of the plot. 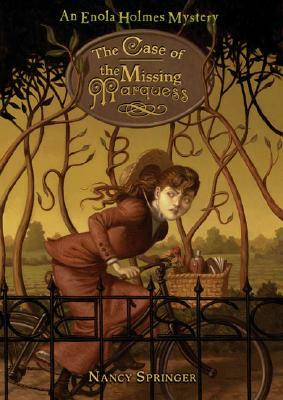 Enola’s observations of dress and manner turn out to be clues in the mysterious disappearance of her mother and a young marquess. Enola’s mother disappears on her fourteenth birthday. At first, Enola feels slighted. Once again her mother has ignored her needs and treated her distantly. But it is as she notices the prolonged nature of her mother’s absence that Enola begins to get curious. She sees that her mother did not just go out on a whim, but rather has made a deliberate escape from a stifling lifestyle. Years of corsets, bustles, and adhering to social expectations of female gentility have driven Enola’s mother to take off. Enola experiences conflicted feelings of anger at being abandoned, and a longing to join her mother in an escape from rigid societal norms. Enola’s much older brothers Sherlock and Mycroft arrive at the estate to track down their mother. To her dismay, they are complete jerks. They treat Enola like a little girl and dismiss their mother’s sudden disappearance as feminine hysteria. Eventually the gentlemen decide that Enola must be sent away to boarding school to be raised as a proper young lady. For Enola, that is the final straw. She begins to make plans. Enola’s mentality shifts gradually when she sees that her brothers will be ineffective and distant. She is at first whiny and frustrated, but then she realizes that she has the knowledge and ability to take action. Enola quietly steals away from the estate and avoids boarding school altogether. She does a great bit of maturing in a very short time out of necessity, and it is a rocky but very engaging journey as the reader experiences Enola’s change of mind. This book gains in strength at the very end when Enola reflects on her growth. I feel compelled to share a quote from the passage here because it is so powerful. It demonstrates how Enola has reclaimed feminine arts and elements of the domestic sphere in order to be a successful and independent woman. This comes at the very end of the book and is a powerful button on the story of a girl who has had to reclaim her individuality. Also, if I were ever to have a band and if we ever managed to record an album, I would call it “Handkerchiefs and Subterfuge.” Thank you, Nancy Springer, for that gem of inspiration. This entry was posted in Middle Grade, Reviews and tagged England, Historical Fiction, Mystery, Sherlock Holmes. Bookmark the permalink.